"Luke, you switched off your targeting computer! What's wrong?" A targeting computer (also called a target device) was a device used aboard starships to aid pilots in targeting their weapons. A target was considered vulnerable when it was aligned with the electronic crosshairs of a targeting computer's gun-sights. They could be upgraded to advanced targeting computers. The size of these devices depended on the power of the weapon being targeted. Smaller targeting computers were used aboard one-man starfighters while much larger targeting computers were used to help target turbolasers. Targeting computers generated a digital projection of the battlefield from the pilot's point of view, and located enemy units with various sensors. 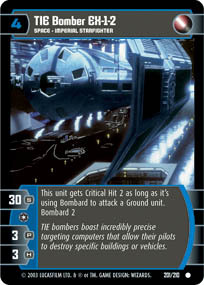 Crosshairs determined where the ranged weapons—whether laser cannon bolts or otherwise—would travel, and the targeting computer also highlighted an enemy fighter, turret, tank, or other target when it came in range of the ranged weapons.